Matthew Brown of Punahou put the ball past Iolani's Joshua Starbuck during last night's final. Good friends off the court and unmatched rivals on it. Spencer McLachlin could've sent off his pal, Kawika Shoji, with a state title in his final season. 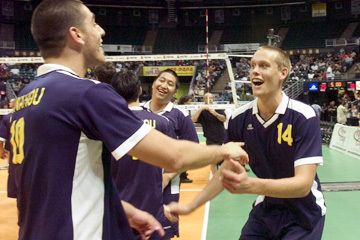 Instead, McLachlin dominated with 14 kills as top-seeded Punahou completed a perfect season with a 21-25, 25-14, 25-18 victory last night in the final of the HHSAA/NewCityNissan.com Boys Volleyball State Championships. It was a second state crown in a row for Punahou, and the school's 26th since the state championships began in 1969. Eleven of those titles came under former coach Chris McLachlin, Spencer's father. Punahou finished this season 19-0, climbing out of the state's toughest conference, the Interscholastic League of Honolulu. "Their goal, they were on a quest to be great," coach Peter Balding said. "They wanted to be able to count themselves among the elite teams we've had." McLachlin isn't ready to think of this year's squad at that level. "I don't know if I can say we're up there, but I'd like to think we're one of the best," he said. McLachlin hit at a .444 clip and also had five digs and three blocks. He shared the task, though, thanks to a deep, balanced Buffanblu squad. Kealii Frank added nine kills (.412) and five blocks, while sophomore Joshua Bninski also had nine kills (.438). 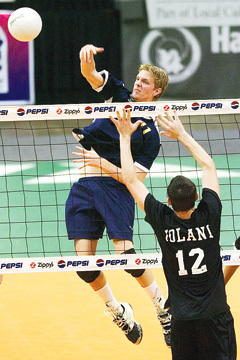 Will Ehrman chipped in with seven kills (.417) and Riley McKibbin dished out 36 assists as Punahou hit .253. Shoji, who signed a letter of intent to play for Stanford, finished with eight kills against a formidable Punahou wall. He also had 10 assists and eight digs. Brad Lawson added seven kills for the smaller Raiders, who struggled to a .065 hitting percentage. "That's what made it exciting for me, playing against Kawika no matter what sport it is, especially for the state championship," McLachlin said. "Iolani played great." Though Iolani was unseeded, the Raiders were ranked No. 2 in the Star-Bulletin Top 10, right behind Punahou, for virtually the entire season. Punahou's two wins over Iolani in league play, plus a preseason victory, gave the Buffanblu no assurances whatsoever. "Iolani just came out stronger than we did," Punahou setter McKibbin said. "We were a little nervous. There's a lot of pressure playing up to everyone's expectations." Punahou's Kealii Frank, left, and Spencer McLachlin celebrated their state title after beating Iolani last night. Game 1 was all about defense for the underdog Raiders. They accumulated eight roofs, including three by their dynamic leader, Shoji. Their play at the net helped the Raiders overcome the scintillating play of McLachlin, who had six kills (.667) in the first game. The Raiders stayed close to the Buffanblu, rallying from an early three-point deficit to take the lead. A roof by Shoji gave Iolani a 16-15 lead, and the 6-foot-3 senior rejected two more Buffanblu attempts moments later as Iolani opened a narrow 19-17 lead. Uncharacteristically, Punahou committed a pair of hitting errors, perhaps due in part to the presence of Shoji and Joshua Starbuck. Those mistakes gave Iolani a 21-17 lead. Punahou pulled within 22-20 after a pair of kills by McLachlin, but a service error by Taylor Akiyama gave the Raiders a three-point margin. A roof by Starbuck, his second of the opening game, on Frank gave Iolani game point. Starbuck put the game away with a quick swing over the middle off a pass by Shoji. The second game was a thorough rout. Frank (four kills) and Bninski (three kills) pounded away at Iolani's defense, sparking an 8-1 run. That gave the Buffanblu a commanding 13-6 lead. Iolani was within 15-9, but McLachlin came back to life. The 6-foot-7 junior had two kills and a roof of Ethan Chang as Punahou regained momentum. Two service aces by McKibbin helped Punahou close out the game with a flourish. Punahou's run continued into Game 3. The Buffanblu's balanced attack, with Ehrman, Frank, Bninski and McLachlin providing firepower, opened a 12-6 lead. Iolani hustled back within 15-11 following a kill and roof by Shoji. However, McLachlin and Frank took turns rejecting Bradley Lawson to slow Iolani's comeback. When it counted most, Punahou turned the match around by outscoring Iolani 22-11 from the midway point of the second game and into the third. "We knew the run was coming," McLachlin said. "We didn't know when, but we could see the trust in each other's eyes." Balding, who has coached off and on for a total of 20 seasons at Punahou, saw more in this year's team than a string of victories. "What sets this team apart is they're great human beings. They have a passion for each other," he said. "I can't think of a better word. They love each other." Punahou was the only team in the state that could have defused Iolani. "That was my goal, for us to play our best volleyball in the last game," Balding said.